Award-Winning Line of Premium Expressions Made From 100% Blue Weber Agave at Hacienda Corralejo in Guanajuato, Mexico, Gaining Ground in the U.S.
Aliso Viejo, California (March 27, 2017) – Tequila Corralejo®, marketed by Infinium Spirits, may be the best-kept secret in the tequila industry. A beloved brand in its home country of Mexico, the award-winning line of premium tequila has been gaining traction in recent years, especially among both acculturated and unacculturated Hispanics in the US. According to the Distilled Spirits Council of the United States (DISCUS), Americans are consuming more tequila than ever before (+9.4 percent sales growth in 2015), and after, whiskey, it’s one of the fastest-growing categories. Tequila Corralejo exemplifies Central Mexico’s rich culture, heritage and vibrant lifestyle. As one of the few tequilas produced in Guanajuato, Mexico, Corralejo’s deep roots and production methods are unique in the tequila industry, dating back to 1755 when Hacienda Corralejo became the first estate in Mexico to produce tequila as a commercial venture. Tequila Corralejo is made with 100% Blue Weber agave, which is handpicked from only the finest agave fields in Guanajuato. The agave is slow cooked in stone clay ovens for 27 hours then rested for 12 hours before going to the mill. All of the tequilas go through a double distillation. The first distillation takes place in a continuous still, or column still. The second distillation takes place in an Alembic copper pot still imported from Tomelloso, Spain, and is what sets Corralejo apart from other tequilas. Corralejo employs the 400-year-old Charentais method of distillation, the same method perfected by the French in distilling cognac, which allows for exceptional retention of aroma and flavor. The result is a flavor in each of the brand’s three expressions that’s rich, natural, and unsurpassed in quality and personality. Corralejo Silver – Made from 100% Blue Weber agave and bottled unaged. 80proof. Gold Medal 2008 San Francisco World Spirits Competition. Corralejo Reposado – Made from 100% Blue Weber agave and aged four months in barrels consisting of three types of oak – French, American and Encino oak. 80-proof. Double Gold Medal 2007 San Francisco World Spirits Competition. Corralejo Añejo – Made from 100% Blue Weber agave and aged for 12 months in charred, American oak barrels. 80-proof. Gold Medal 2016 San Francisco World Spirits Competition. Managing Director Don Leonardo Rodríguez Moreno, a 25-year industry veteran, is key to maintaining the artistry and craftsmanship for which Tequila Corralejo has become known. The tall, colorful bottles inspired Corralejo’s brand messaging: Those With Pride Stand Tall. All of Corralejo’s bottles are produced at a glass factory also owned by Moreno, a few miles away from the distillery. In fact, the brand is one of a handful of tequila companies granted the right to produce tequila outside of Jalisco. The distillery is located on the grounds of Hacienda Corralejo, the birthplace of Don Miguel Hidalgo y Costilla, about 70 miles outside of Guanajuato, Mexico. 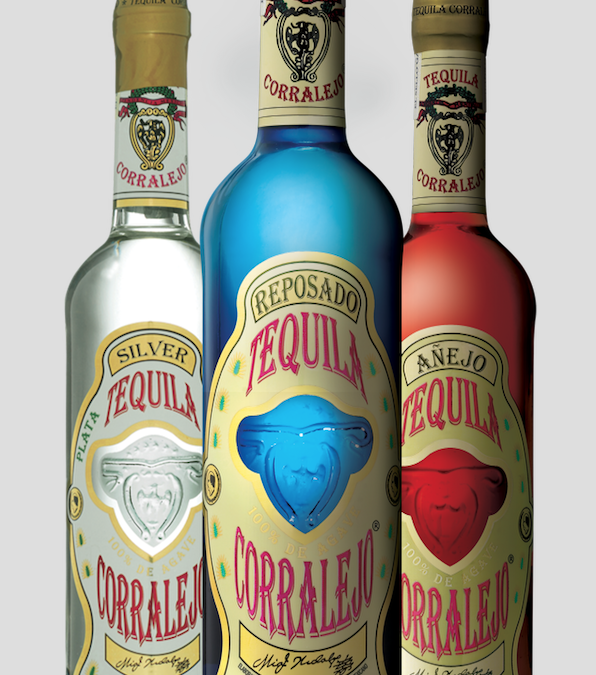 Tequila Corralejo is available in 750ml bottles in both on- and off-premise establishments across the United States. The suggested retail prices, which vary by market are: Silver ($21.99), Reposado ($25.99) and Añejo ($32.99). Both the Silver and Reposado expressions are also available in 1.75L bottles for $42.99 and $46.99, respectively.